This pattern was a Tunisian-Along (TAL), done on my website and youtube channel. The TAL consists of 6 Parts which all appear on the website and are supported by youtube videos from my channel. Links to each video is given in the written pattern. 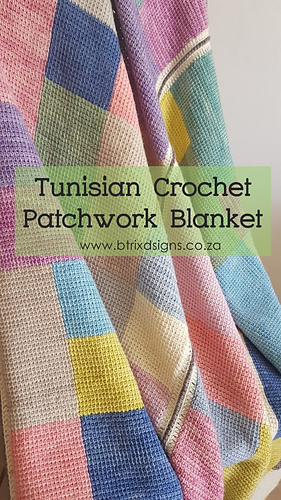 The whole aim of this pattern and TAL is to teach Tunisian Crochet to beginners as well as providing many tips for the intermediate crocheters, and at the end, to grow the Tunisian Crochet community and enjoy this skill. 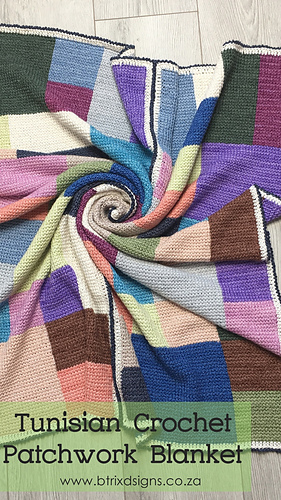 The pattern is worked in Tunisian Simple Stitch (Tss). A schematic is available to show the sizes of the different blocks, as well as a schematic for working the blocks in the different colours and their layout. There are also methods available on how to substitute the suggested yarn on both the website and the videos.